All are invited to the Cross, to the place where God and humanity meet. But remember the Cross is not the soul rescuing power…the power is in the ONE who bore its shame…your shame. Christ poured out Himself to death. He would reap the unspeakable reward of seeing limitless numbers of once helpless, hell-bound, sinners die with Him in Faith, then raised to walk in newness of life. The invitation of God’s Grace and Mercy comes to you only through His Son… from a person who lived and died for you. A person still alive today who will be your advocate and claim you as His own when you stand before the Judgment Seat of God…saving you from eternal hell. Jesus had to face His Cross alone. His father, who cannot look upon Sin had to turn away, while His Son suffered for the past, present and future Sins of all humankind. But you will not have to carry your Cross alone. Jesus has promised to carry it for you. The storms of life will rage around you, but Jesus promised to be with you, lead you and give you His peace in this life. When Jesus says He will keep you safe, He means it. Hell will have to get through Him to get to you! When He says He will get you home…He WILL get you home! Your eternal future begins at the foot of His Cross. His story must become your story. His journey must be your journey. 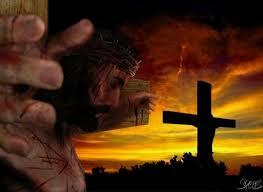 Don’t go through this life alone, take His outstretched hand.